The historical cultural site of Qasr Al Hosn, the oldest and most significant heritage site in Abu Dhabi, has been re-launched after the completion of a reconstruction and renewal project conducted by the Department of Culture and Tourism Abu Dhabi. The site, opened by Sheikh Mohamed bin Zayed Al Nahyan, Crown Prince of Abu Dhabi and Deputy Supreme Commander of the UAE Armed Forces, included four connected areas, which are the Al Hosn Palace, the National Consultative Council, the Cultural Foundation, and the House of Artisans, reported Emirates news agency Wam. The Qasr Al Hosn, which is located in the centre of the city of Abu Dhabi, transformed from a centre of fishing and pearl fishing to one of the world’s modern international cities. Sheikh Mohamed bin Zayed said that the area showcases Abu Dhabi’s ancient history, as the fathers and grandfathers built the landmark with determination while pointing out that through their cohesion and solidarity, and due to their sacrifices, everyone is now living in a modern country that has a prestigious stature among nations. "We are inspired by the values of the grandfathers and founders, and we recall their inspiring stories and convey their heritage, culture, values and civilisation to future generations," he said. 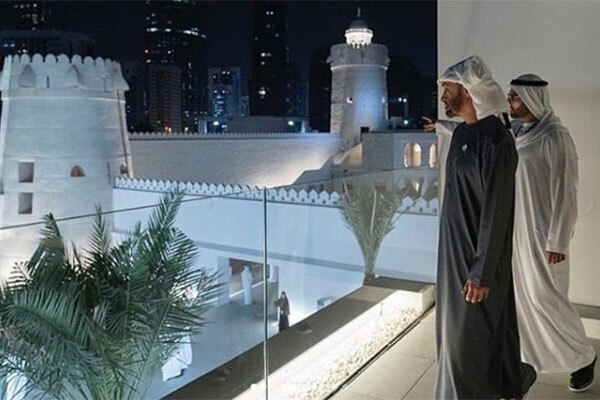 During the ceremony, Sheikh Mohamed, Their Highnesses the Sheikhs, and the attendees toured the area and learnt from Mohammed Khalifa Al Mubarak, chairman of the Department of Culture and Tourism in Abu Dhabi, about the reconstruction and renewal of the Qasr Al Hosn, which was transformed into a museum that showcases the history of Abu Dhabi. They also visited an exhibition, titled, "Artists and the Cultural Foundation: Beginnings," which exhibits works by Emirati artists, as well as the "House of Artisans" that showcases traditional Emirati handicrafts. The ceremony also included a storytelling light show on the walls of the palace, the Cultural Foundation, and the courtyard extending between the two sites. The ceremony presented scenes about the country’s heritage and stories related to the palace, which symbolises the emirate’s ancient history. The audience then witnessed the story of how the people of the region moved from the desert to the coast, and how the Bani Yas tribe settled in Abu Dhabi Island and formed its first community. Qasr Al Hosn is the oldest and most significant heritage site in Abu Dhabi city, encompassing two iconic buildings: The Inner Fort, which was built around 1795, to protect the settlement of Abu Dhabi established on the island in the 1760s, and the Outer Palace, built in the 1940s. A witness to Abu Dhabi’s vibrant history, over the past two centuries, it has previously been home to the ruling family, the seat of government, the consultative council and the national archives. Now transformed into a national monument following several years of rigorous and ambitious conservation works, Qasr Al Hosn is a monument that traces the city’s development from a settlement reliant on fishing and pearling in the 18th Century, to a modern, global metropolis. Visitors may also visit the historic National Consultative Council building, site of the early discussions and negotiations on the unification of the Emirates. The Inner Fort exhibition traces the story of Qasr Al Hosn and the many historic events it has witnessed, exploring the settlement of Abu Dhabi island, everyday life in the Fort and showing how this historic landmark was once both a ruling family home and a busy administrative centre. The Outer Palace was constructed by Sheikh Shakhbut bin Sultan Al Nahyan in the 1940s. The rooms display the stories of the people who lived in the Palace and their everyday lives. Visitors will explore the personal quarters of Sheikh Shakhbut bin Sultan Al Nahyan, or part in the Ruler’s Majlis. Films, interactive displays and oral histories bring these stories to life, together with original artefacts and treasures from the past. The newly renovated premises of the Cultural Foundation will host a diverse programme in its new Visual Arts Centre, including a landmark inaugural exhibition focusing on the building’s history as a beacon for UAE artists. After the opening of The Cultural Foundation allows access to the Visual Arts Centre, which in addition to the exhibition halls will feature workshops and art studios. The two remaining components – a 900-seat theatre and the first Children’s Library of its kind – will open in 2019. Al Hosn site will be marked with a week-long celebration from December 7 to 15. Free tours, events and musical performances will bring the site’s history to life and offer visitors a glimpse into the story of Abu Dhabi and its people.